“Since the narrative is rooted in grief and centres around the loss of a father figure from the perspective of a young teenager, I knew we needed to cast someone who would immediately connect with our audience on an emotional level. “Lakeith has been a close friend who has continued to inspire me with both his talent, but also with his genuine curiosity. You can easily spend hours talking to Lakeith about almost anything and expand your perspective on everything from religion to Death Grips. Watch the gripping short film to accompany Michael Kiwanuka’s ‘Cold Little Heart’ below. To read more about Kiwanuka and his music on TGTF, go here. Following the selling out of his previously announced English tour slated for this spring, British soul singer/songwriter Michael Kiwanuka has some good news for fans who missed out on tickets to the shows in April and May. He has revealed additional dates for this autumn, at some truly breathtaking symphonic venues, to further support his 2016 album ‘Love & Hate’. (Carrie’s glowing review of Kiwanuka’s sophomore album can be read here.) Tickets to the shows listed below go on sale this Friday, the 3rd of March, at 10 AM. We’ve covered Michael Kiwanuka quite a bit here on TGTF, and you can flip through our past writings on him if you follow this link. With racial and class tensions coming to a head both in America and the UK, British Ugandan Londoner Michael Kiwanuka occupies a rather unique position in time and society upon the release of his second album ‘Love & Hate’. As he profoundly explains in the album’s lead single, “I’m a black man in a white world / I’m in love but I’m still sad / I found peace but I’m not glad”. That song, ‘Black Man in a White World’, is the most immediately outstanding track on the album, but it’s also central to the development of the album as a whole. Kiwanuka illustrates its thematic duality by alternating between a gritty musical setting of rhythmic handclaps, blues-inflected guitar lines and gospel backing vocals and a more elegant arrangement of soaring strings and subtle keyboard lines. The juxtaposition of those two seemingly opposite musical styles is at play throughout ‘Love & Hate’, starting with opening track ‘Cold Little Heart’. Its delicate and slowly-evolving orchestral arrangement pivots around a repeated figure in the backing vocals, morphing into raw soul and sensuality as Kiwanuka intones the question in the song’s opening lyrics: “Did you ever want it? / Did you want it bad?” ‘Cold Little Heart’ transforms again at its close, paring down to Kiwanuka’s starkly exposed and richly-textured voice over a single acoustic guitar ahead of the final coda. Title track ‘Love & Hate’ finds focus in a similar backing vocal, which along with the song’s deep bass groove and dramatic string gestures portrays an almost hypnotic swirl of emotion. The graceful fluidity of the arrangement is only enhanced by the wailing guitar solo in the bridge and the echoing production effects. Later in the tracklisting, ‘Rule the World’ is gentler and more introspective but again punctuated by a remarkably effective arrangement of backing voices, adding significant depth and colour to Kiwanuka’s already rich sonic tapestry. ‘One More Night’ is straightforward blues rock, with a hip-swaying bass rhythm and a dense arrangement of brass behind Kiwanuka’s thick vocals and sultry guitar melodies. It stands out for its relative simplicity in comparison to the rest of the songs on the record, but Kiwanuka hints at internal strife and resisting temptation in the song’s elusive lyrics: “I’ll be trying in the morning . . . no more lies in the day”. Kiwanuka shifts his focus even more sharply inward for the final pair of songs on the record, which showcase the self-described “confessional aspect” of his songwriting. ’Father’s Child’ starts in a bright, buoyant tone and finishes with a darker sense of self-doubt as Kiwanuka contemplates his own spirituality. Album closer ‘The Final Frame’ tackles the dual-nature of romantic commitment, passion vs. placidity, in a slow and evenly-measured ballad spiked with a potently seductive guitar solo. Describing the themes on ‘Love & Hate’, Kiwanuka explains, “A lot of this album was grappling with the insecurities that I’d learned. The first album was grappling with faith. Here, I’m not so worried about that – I’ve accepted that it comes and goes, and now, I’m left with myself.” Unfettered by the heavy burden of expectation that surrounded his debut album ‘Home Again’, ‘Love & Hate’ finds Kiwanuka coming to terms with duality, both in himself and in the world around him, and finding an exhilarating sense of artistic freedom as a result. Michael Kiwanuka’s sophomore album ‘Love & Hate’ is due out today, Friday the 15th of July, on Polydor Records. In support of the new album, Kiwanuka will play a list of headline dates in the UK this October. TGTF’s collection of previous coverage on Michael Kiwanuka is back this way. ‘Cold Little Heart’ was the first song I wrote for this album and it helped direct where the music was going. It’s really influenced by classic 60s and 70s British guitar bands like The Who and Pink Floyd, as well as by a lot of soul music, particularly songs like ‘Walk On By’ by Isaac Hayes. Those songs build really slowly and sometimes a vocal wont come in until 5 or 6 minutes but you don’t realise you’ve been sitting and listening for that long because all the instruments are so enticing and so beautifully arranged that they grab your attention and it doesn’t matter that you’re waiting until the vocals come in. ‘Love & Hate’ will be available starting this Friday, the 15th of July, on Polydor Records. For more articles on Michael Kiwanuka on TGTF, go here. Soul singer Michael Kiwanuka has kept very busy recently, promoting his forthcoming second album ‘Love & Hate’ with a series of live sessions for television and radio. Back on the 31st of May, Kiwanuka took the stage on ‘Later…with Jools Holland’ to give a bold performance of his new track ‘Black Man in a White World’, accompanied by a full band and gospel chorus. Kiwanuka’s soulful refrain was punctuated by rhythmic handclaps and insistent guitar riffs that combined with dramatic stage effects to create a forceful visual and sonic impact. The very next day, Kiwanuka made an appearance in the BBC Radio 1Xtra Live Lounge where he presented a significantly more delicate acoustic performance of Prince’s ‘Sometimes It Snows in April’. In contrast to the above performance of ‘Black Man in a White World’, Kiwanuka’s bandmates in the Live Lounge contribute only gentle percussion and soft harmony vocals, and the relative stillness of the shadowy studio amplifies the effect of Kiwanuka’s stark interpretation. Finally, on the 7th of June, Kiwanuka played a live studio session for BBC 6 Music with Lauren Laverne, where he performed his hypnotic new album track ‘Father’s Child’. Video of the BBC 6 Music session is available here, for a limited time. 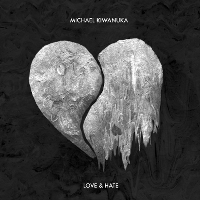 Michael Kiwanuka’s second album ‘Love & Hate’ is due for release on the 15th of July via Polydor. If you missed it, you can take a look back at Kiwanuka’s official video for ‘Black Man in a White World’, along with his list of October tour dates, right here. Our full collection of coverage on Michael Kiwanuka is this way. London soul musician Michael Kiwanuka has unveiled a list of live dates in the UK and Ireland for this October, following a slate of festival appearances around the release of his second album ‘Love & Hate’. The album will drop on the 27th of May on Polydor Records, but you can watch the video for its first single ‘Black Man in a White World’ just below the tour date listing. Tickets for the following live dates will be available this Friday, the 8th of April, at 9 AM. Ahead of the tour dates listed below, Kiwanuka will perform at The Great Escape in Brighton in May, the Latitude Festival in July, and the Boardmasters Festival in Cornwall in August. Our previous coverage of Michael Kiwanuka is back this way.